F.P. 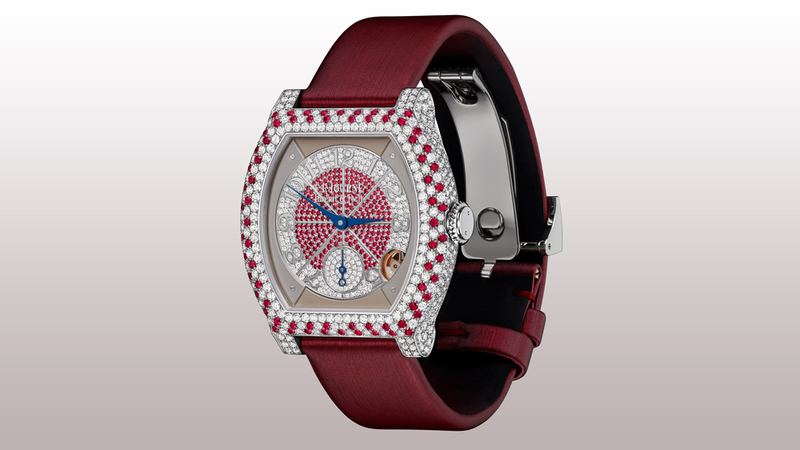 Journe has unveiled a sparkling new collection of ladies' timepieces called élégante. The stunning new watches are set with pave diamonds and multi-colour precious stones in the watchmaker’s rounded and rectangular Tortue case. The line was first introduced in 2015 with platinum, red gold, and titanium timepieces, with a sporty rubber strap and Arabic numerals. This year, the 40 mm timepiece (price upon request) has been offered in vibrant new colours like ruby red, sapphire blue, and emerald green, as well as black. It took eight years of research for F.P. Journe to develop the in-house quartz movement. The highlight of the movement is that it will go in standby mode when the client isn’t wearing the timepiece. That means a microprocessor will continue to measure the time, but mechanical elements such as a great rain, rotors, and hands will stop moving; when the watch is worn again the hands automatically set themselves to the correct time. The electromechanical movement is fitted with a mechanical motion detector visible on the dial at 4:30, and after 30 minutes of motionless, the watch will switch to standby mode to save energy. The case of the four new timepieces are set with rubies, blue sapphires, tsavorites, and black diamonds with a powdered satin bracelet to match each gem setting. The dial also features a stone setting to match its colour theme with a white diamond hour circle with Arabic numerals. On the black version, the hour circle is set with black diamonds and a white diamond centre. The folding clasp is also set with diamonds on each piece. The élégante collection is available in a 40 mm titanium case (with or without diamonds); a 40 mm 18-karat rose gold case set with one row of diamonds, pave-set, or without diamonds; a platinum case with pave-set diamonds along with a pave-set dial; and a large 48 mm oversized version in titanium with a rubber strap available in nine colours with a pave-set bezel on a karung silver white snake strap. Even for female collectors that prefer a more complicated movement, this is a beautiful collection for women looking for a stunning evening watch.